Everyone lives in a watershed and Healthy Landscapes lead to Healthy Waters! How we conduct our lives can have an effect on the water quality of our Chautauqua Lake. Fortunately, there are many simple things that each of us can do to be stewards of Chautauqua Lake and help to decrease the amount of sediment and nutrients entering our lake and polluting our waters. 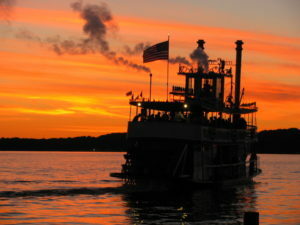 Come and join us for an evening on the Chautauqua Belle to observe and learn about the importance of natural shorelines, buffer strips, and re-naturalization projects occurring on the shoreline and in the watershed to prevent and reduce water pollution, soil erosion, and mitigate clear water and a healthy Chautauqua Lake. About The CLA and CWC: The Chautauqua Lake Association and The Chautauqua Watershed Conservancy are both non-profit organizations that share educating the community about Chautauqua Lake’s ecosystem and environmental lake management practices in their mission statements. Both are dedicated to addressing the root causes of the excessive plant and algae growth and loss of lake depth due to sedimentation and runoff. Together, the organizations have over 90 years of experience with research-based approaches and dedication to protect our beautiful Chautauqua Lake and we are partnering on an educational campaign to inform the community on how our actions in the watershed can translate to a healthy Chautauqua Lake.